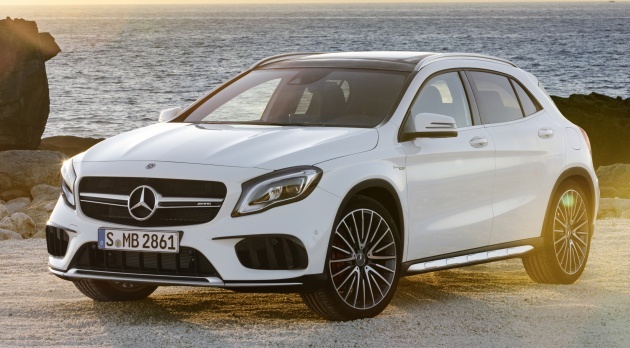 The debut of the revised 2017 Mercedes-Benz GLA range in Detroit also saw the introduction of the Mercedes-AMG GLA 45 4Matic variant, which has also been updated accordingly. The refresh brings about a more dynamic looking front, with a restyled apron, new air intake grilles and a front splitter insert finished in silver chrome in addition to flics in high-gloss black among the new styling cues. At the back, the reworked X156 gets a new diffuser insert for the rear apron as well as a new spoiler lip on the roof. The front and rear styling revisions also help improve the aero ability of the car, the automaker says, increasing the vehicle’s driving stability while lowering its wind resistance. Previously optional on the pre-facelift, the new GLA 45 now features LED High Performance headlamps as standard, and new wheels include an optional multi-spoke 20-inch light-alloy wheel in painted matte black with high-sheen rim flange or painted titanium grey with a high-sheen finish. As for the interior, updates include a dashboard top covered with Artico man-made leather as standard and new trim. Finished in printed matte with a high-gloss surface and AMG lettering, it’s available in black/red as standard or in black/silver if buyers opt for the Exclusive package. Elsewhere, the car key and the E-Select lever now wears an AMG emblem as standard, and the instrument cluster gets a new screen design, with the speedometer now divided into 30 km/h segments, as well as new needles with a black needle centre. Kit available for the car includes keyless Hands-Free Access and a 360-degree camera. No revisions in output to the turbocharged AMG 2.0 litre four-cylinder mill, which was already updated in output back in 2015, and figures remain at 381 hp at 6,000 rpm and 475 Nm at 2,250-5,000 rpm. It’s paired with an AMG Speedshift DCT seven-speed sports transmission, with all-wheel drive AMG performance 4MATIC present to transfer the drive power to all wheels. Performance figures include a 0-100 km/h time of 4.4 seconds and a 250 km/h electronically-limited top speed. 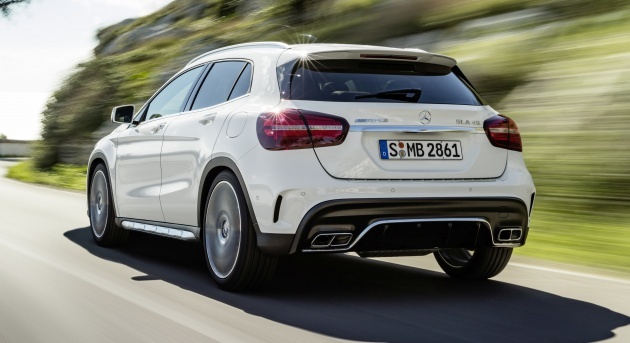 On the options list is an AMG performance exhaust system and an AMG Dynamic Plus package, complete with a mechanical front axle locking differential. The package also includes the AMG Ride Control sports suspension, a performance steering wheel and an additional Race drive programme mode. There’s a Yellow Night Edition for those who want their ride to be a bit more unique. The package, which is also available for the A 45 and CLA 45, includes exclusive night black or cosmos black paint and matt graphite grey and yellow appliqué sections. The edition rides on light-alloy wheels in matte black with yellow rim flanges and also features a black painted AMG twin louvre in the radiator grille, and yellow highlights can be found on the front apron, side mirror housings, side skirt inserts as well as on the rear diffuser and the rear wing. Yellow touches are also to be found inside. The AMG performance seats also sport yellow trim, as do the AMG performance sports steering wheel, the rear bench seat, the dashboard and the armrests. Further highlights include door sill panels in graphite grey with a yellow AMG logo, the floor mats with yellow edging, the AMG logo also in yellow, plus yellow air outlets. As standard, the Yellow Night Edition will come equipped with an Aerodynamics package, a Night package, a Light and Sight package. No RV car, wait 1 year and you can buy this car in mudah for half price.